Hard wearing and long lasting, nylon lanyards are perfect for carrying bulky items such as a set of keys, mobile phones or water bottles. Nylon printed lanyards also make the printing options available much wider with plenty of room for your name, contact information, logo and slogan to be included in the design, often many times over. They can be used with any kind of attachment that you wish, including dog clips, swivel clips and safety release clips. Give them to your employees or hand them out at your next trade show to get your brand seen and talked about. The "Cadillac" of all lanyards is certainly the imprinted nylon type. 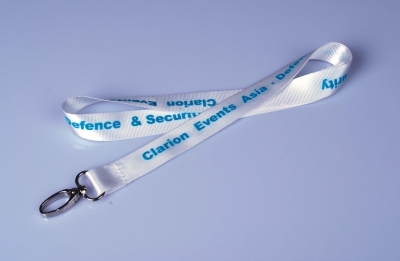 When ultra-fine detail and a more robust material is required, nylon custom lanyards are the most appropriate choice. The surface of a nylon lanyard is even smoother than other types and produces a more fine print detail than polyester. These custom lanyards are normally used when "only the best will do." As with all of our custom lanyards, many attachments can be added for further customization. Badge reels, badge holders, break-away, and key rings are just some of the options available. 2012 © Copyright GoodLanyards.Com. All rights reserved.